The 24 x 24" Smith-Victor FL24 Softbox for FL110i comes with front and internal diffusion, a speed ring, rods, and a case. It mounts to the front of any FL Series monolight to soften the subject. 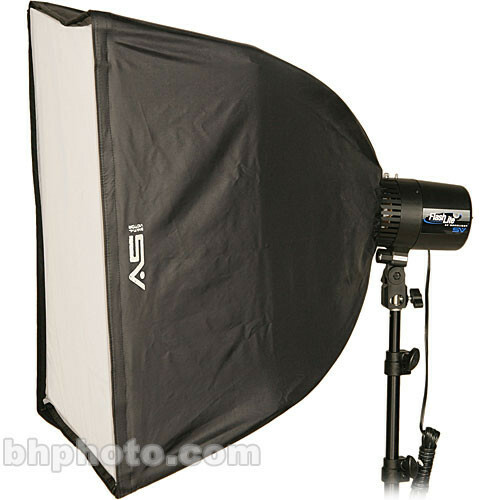 This size softbox is an appropriate size for a head shot or small product shot. Box Dimensions (LxWxH) 23.1 x 6.2 x 2.8"
FL24 Softbox for FL110i (24 x 24") is rated 1.0 out of 5 by 1. Rated 1 out of 5 by Anonymous from Not a memorable purchase Although I intended to use it for head shot portraits I don't believe I'll ever get it assembled to use for anything. The problem could be me, however even an IQ of 140 couldn't get it assembled and there are no instructions to guide you through the process. After reviewing numerous videos on the web I still could not make sense of the assembly process.